Martin Whatson is a Norwegian stencil artist, born in 1984. He studied Art and Graphic Design in Oslo, at the Westerdals School of Communication. There he started to develop an interest in the art of graffiti and stencil. Since 2004, he started producing his own works, and has participated in many exhibitions. He also collaborated with many other urban artists. A street art follower since the nineties decade, it wasn’t until he discovered Banksy when he decided to try with the stencil. This is why his work combines these two elements in a unique way and it is characterized by grey monochromatic images done with stencils and decorated with graffiti of vibrant colors. Martin Whatson is inspired by people, posters or other graffiti and has a weakness for urban spaces that are decayed and abandoned. When starting out he found himself drawn to political subjects, inspired by DOLK and Banksy, but over time found his depth in more subtle types of expression. His work is not charged with a political or social criticism but he likes to leave a subtle message on which anyone can reflect and draw his or her own conclusions. Martin Whatson creates unique stencil scenes, with a message signifying peace and love, and a very distinct female edge. Yet his work still appeals in a masculine way, packed with bold statements that say a lot about the world today. He is an emotional artist that seeks to transmit feelings and with a great taste for aesthetics and the beauty of images and color. 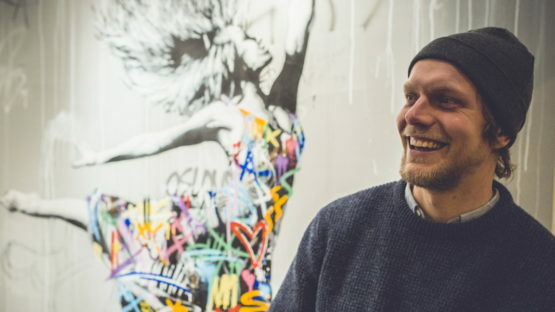 We can find his work shown to the public in urban murals in cities of his homeland, like Stavanger or Oslo but he has also crossed his country frontiers to other places like Paris and Tokyo. Nowadays his works combine these urban mediums with works developed on canvases or other materials such as metals or wood. Regarding Martin Watsons’ graphic work, we can say that he is a quite prolific artist and his prints are sold out really fast. There aren’t many prints we can find in galleries as the mayor part of his editions are limited to only a few copies, usually hand finished, and because of that, a big part of them is already in hands of private collectors. In the many festivals and exhibitions he has participated in for about a decade now, Martin Whatson had the chance to work with other urban artists such as Roamcouch, Pure Evil or Snik. Striving to be different, Martin finds beauty in what most people find “ugly”, unfashionable or simply out dated, creating something beautiful out of what most people don’t even notice in daily life. This interest has helped develop his style, motives and composition. Since his artistic debut in 2004, he has had several solo shows and participated in many group exhibitions, both nationally, and internationally in cities like Tokyo, Paris, London, New York and Los Angeles.